How to Quill - Using a Slotted Quilling Tool. Considered essential to many quillers around the world, the slotted tool makes rolling paper much faster and easier than rolling by hand or using a needle tool. Along with paper strips, it is one of the first items I recommend you purchase if you are just beginning to quill. There are many versions of the slotted tool available for purchase in the market today. The main four are wooden handled, metal, plastic and silicone coated as is shown in the photographs of this article. Which you choose to use is entirely a personal preference. One important item to consider when looking for a slotted quilling tool, is what the inner shaft is made of (or if it has one at all). Inferior silicone coated tools will often times have a plastic inner shaft that is prone to breaking. More often than not, plastic and wooden tools have the slotted metal portion simply glued into a small hole that was placed at the top. This can be a problem when you quill often due to the constant rotating motion may cause the quill to come loose. You may also see versions that offer a slotted tool on one end and a needle tool on the other. While in theory this sounds like a good idea, in practice it can be an accident waiting to happen. 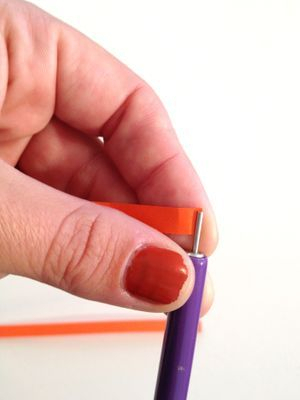 Place the outer edge of a quilling paper strip inside the slot located at the top of the tool and roll. Which way you roll, towards yourself or away, is up to whichever you find more comfortable. Continue to roll until the end of the strip is reached and carefully remove it from the tool. While the art of quilling is on the rise, you are still unlikely to find a quilling tool at your local craft store. This is not an absolute however, as I purchased my very first tool from a Hobby Lobby in Indiana. 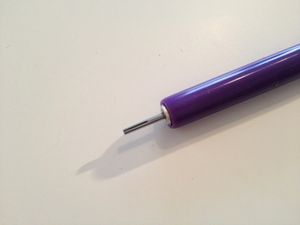 It was a plastic piece of junk made much the way a pen is and broke within a week's time. If a store near you does happen to carry any quilling products, you will be able to find them in the paper or scrapbook making section. You best bet at finding a good quality tool will be from a quilling paper source on the internet. As of this writing, there are three major companies in the US that offer quilling supplies, Lake City Crafts, Quilled Creations, and Paplin Paper Products. The first two offer direct consumer purchase from their websites. Paplin's products are sold through affiliate sites, including this one. You can find products and slotted quilling tools from all three companies in our Paper & Products Shop. In the UK, J&J Quilling Design. You can also easily make your own tool if you are ready to give quilling a try and do not want to wait for the mail to arrive. Spitting the head of a toothpick works well and leaves you with a very small center hole which is nice. These break and fray often, so expect to go through them rather quickly. Your second option is to use a Sewing needle. Clip the top of the hole with wire cutters, put a strong glue (like E6000) along the pointed tip and insert it into the tip of a recycled wine cork. Now that you know how to use one and where to get one, it is time to put your slotted tool to good use. You can learn all of the basic quilling shapes by following along with our Quilling Shapes Tutorial. If you are ready to move past the basics, you can find a new quilling project to create by checking out our Free Projects & Tutorials Page.